Hi gang! Not much going on here lately, and I’m sorry to report that it’s still the case. Only thing I’ve got to contribute with is this little shill post. I’ll try to be brief. In the future, I’ll post nothing but painted toy soldiers. Honest. This christmas, I re-evaluated my hobby endeavours a bit and decided to axe as much as I could of my collection and stalled projects. For instance, I’m cleaning out all my 15mm stuff. Painting the minis are almost as much work as 28mm, so instead I’m looking at 10mm for elements based mass combat gaming. Click image to visit the IGG campaign! With 14 days to go, the funding is at two thirds. I would love to see these in production asap, so figured I’d pimp the campaign a bit. I’m in for €28 (7 packs of miniatures) but I’m considering doubling that or at least getting a few extras. To top it off we get a free digital copy of Mayhem too – a rule system I’ve heard nothing but good about. As for what I’m currently working on, I’ve got this half-assed WIP picture to share. 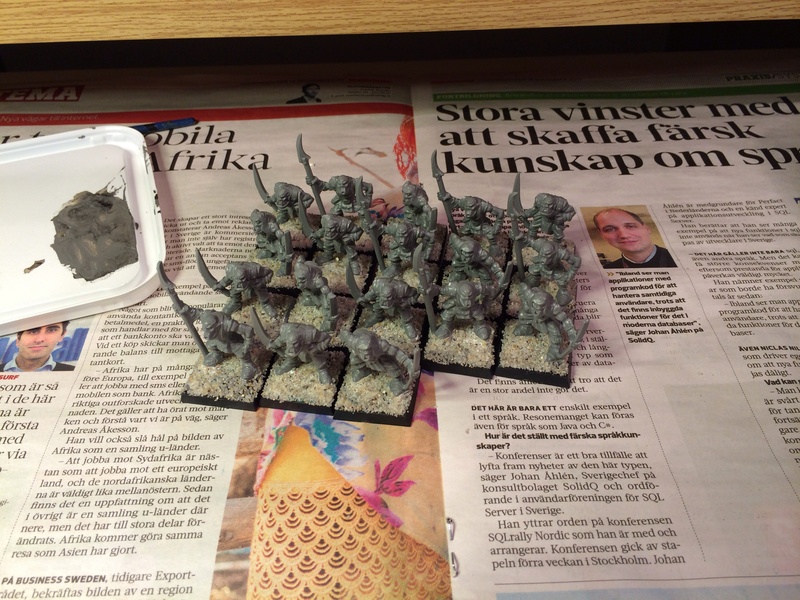 I hope to have them painted up in a not too distant future. 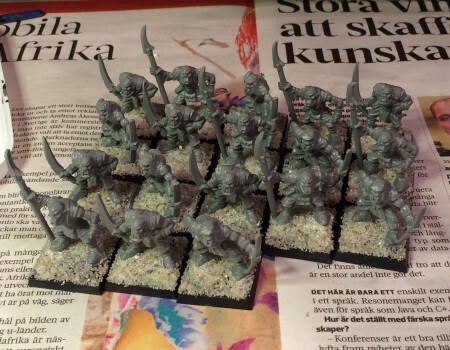 They’re EM4 orcs that will serve as hobgoblins in my monopose plastic WHFB project. Yeah, those are bows, swords and polearms mixed… I’m not too fuzzed with WYSIWYG gaming. Having thrown my lot in with 15mm for mass battles the Evil Men KS is unfortunately not much good to me, although I did heartily froth when I saw ’em. I am very keen to see your take on a smaller scale and basing elements and you already know my thoughts viz. ‘Mayhem’. I look forward to watching this project develop.